Wi-Fi is the fastest way of wireless file transfer which can transfer megabytes of a file within few seconds. There are also many other ways of file transfer such as USB, Bluetooth but USB 3.0 is the fastest way for sending and receiving files. People are also aware of the Wi-Fi direct which can be used to transfer files between two phones and there are also many other apps which can transfer file over Wi-Fi which can be downloaded from the Play Store. But here you will see file transfer between a PC and phone in a Private Wi-Fi network. A private network can be described as the network which is used for connection home PCs together. This Private network can connect multiple PCs to the internet through a single IP address. But other people outside the network cannot see the connected PCs on that particular IP address these PCs are connected with a router. This tutorial is for Android phones and Windows PC. Make sure to enable file and printer sharing in your PC first. Go to Control Panel> Network and Sharing> Change Advance Sharing Settings. Here you will see your network type then enable Network Discovery and File and Printer sharing. In Windows 10 search directly for “Advance Network Settings”. 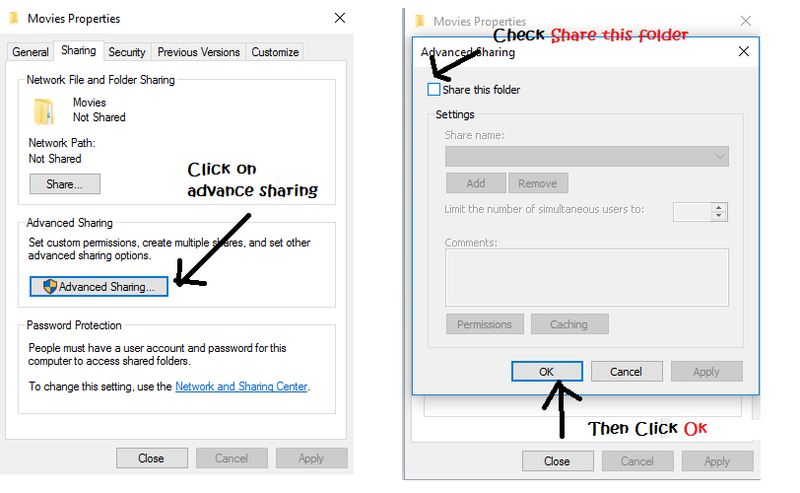 To share a folder over the network Right click on the folder then go to sharing tab then click on advance sharing and enable Share this Folder. Now connect your phone to the same Wi-Fi Network and download ES file explorer from Play Store. You can also use Asus File Manager which is also available in the Google Play Store. Now from the list of Folders and files you can copy any of them to the phone. If you are note able to view PCs which are connected to the router, then your router might not be configured properly. Make sure Enable Plug n Play option in the router. If the DHCP server is disabled in your router, then you might not be able to view the devices which are connected to the Network. You can also use your mobile’s hotspot for connecting Laptop or Wi-Fi PC to smartphone but you have follow above steps to see make you computer and folders visible.